The European Center Medium Range forecast model- ECMWF began running at a much higher resolution this week with significant improvements in accuracy. Synoptic weather forecasters like me have been looking forward to the upgraded ECMWF forecast model for months now. This model is already the guidance of choice for medium and long range forecasts (2-10 days), and now it is running at an even higher resolution with other improvements as well. An ensemble of several different daily runs (that is key to diagnosing which solution is more likely when models differ) is also now running at greater resolution, and this will likely improve long range forecasts around the world. Some of this data is online, but the good stuff you have to pay for, and trust me it’s quite good. NOAA now has new and fast computers and is looking at improving their global model as well, although with an even faster computer coming soon at the weather centre in the UK, it looks like Europe will remain the leader in long range forecasting for sometime to come. ECMWF has launched a new model cycle bringing improved global weather forecasts at record-breaking resolution. The new grid on which the forecasts are run comprises up to 904 million prediction points, three times as many as before. Together with other upgrades to ECMWF’s Integrated Forecasting System (IFS), the changes mean that Europe’s weather can now be predicted with more detail, with greater accuracy and, as a result, up to half a day further ahead. The new cycle reduces the horizontal grid spacing for high-resolution forecasts from 16 km to just 9 km. Ensemble forecasts, which describe the range of possible weather scenarios and the likelihood of their occurrence, usually use twice the grid spacing of high-resolution forecasts. They are now at 18 km up to forecast day 15 and 36 km thereafter. The vertical grid spacing is unchanged. The assimilation of weather observations into the forecasting system has also been improved. This enables a better assessment of the current state of the atmosphere used to initialise a forecast. Twelve-hour ensemble control forecasts of 2-metre temperature for a coastal area in Norway valid at 12 UTC on 7 January 2016. 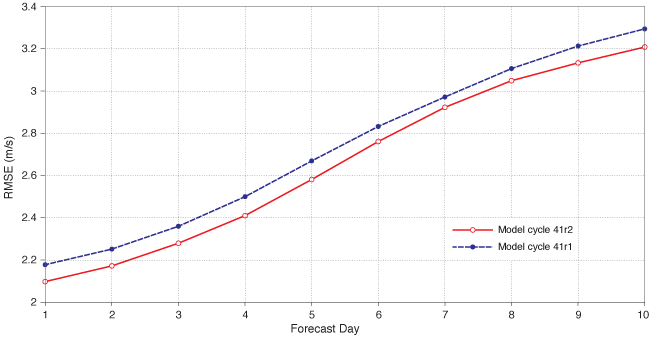 The forecasts were produced using the previous model cycle (41r1 – left) and the new model cycle (41r2 – right). The diamonds show observed temperatures. The charts show that spurious cold areas have disappeared in the 41r2 forecast thanks to the higher resolution as well as improved radiation physics in the new model cycle. ECMWF’s Director-General, Florence Rabier, said the improvements in accuracy and range represented “a big step forward”. “The impact of the weather and its potentially deadly extremes is one of the key challenges facing emergency response services, policymakers, and industry. This makes the role of the National Meteorological Services that we serve critical to society,” she observed. The new model cycle improves the accuracy of forecasts by between 2 and 3 per cent for many parameters. This translates into a greater forecast range at the same level of quality. The range is generally extended by several hours and by as much as half a day in some cases. Root-mean-square error of high-resolution 10-metre wind speed forecasts in Europe averaged over 12 UTC forecasts from 10 August 2015 to 25 February 2016. Forecasts produced using the new model cycle (41r2) have consistently smaller errors than those produced using the previous cycle (41r1), and the forecast range at the same error level is larger for the new model cycle by 12 hours or more at most forecast days. The increased resolution leads to a better representation of coastlines and orography with the potential for improved local predictions. Changes in the radiation physics lead to particular improvements in near-coastal 2-metre temperatures in places where surface conditions vary abruptly. The structural representation of tropical cyclones is also improved with a more clearly defined eye and better-resolved rainbands. Tropical cyclone intensity is improved in ensemble forecasts. Continuous Ranked Probability Score (CRPS – a measure of skill) for ensemble forecasts of 2-metre temperature in Europe averaged over 12 UTC forecasts from 10 August 2015 to 25 February 2016.Forecasts produced using the new model cycle (41r2) have consistently better CRPS values than those produced using the previous cycle (41r1), and the forecast range at the same level of skill is larger for the new model cycle by 12 hours or more across the range shown. Some of the improvements are the result of more observations being assimilated into the system. For example, microwave data is used in more challenging situations, such as mountain areas and snow-covered land surfaces, and coverage of satellite-derived winds is improved in the mid-latitudes. The analysis and ensemble of analyses – which enable a flow-dependent estimation of the weights to be given to the observations – see their resolution increase substantially too, contributing to the improvements of the high-resolution initial conditions and forecasts. Grid points are arranged differently to distribute them more uniformly across the Earth’s surface, saving computing time. The new layout coupled with the increase in the number of grid points also removes forecasts of spurious ‘grid-point storms’. Accumulated 24-hour precipitation for 24-hour forecasts starting from 15 July 2015 00 UTC in the Horn of Africa near Lake Tana. 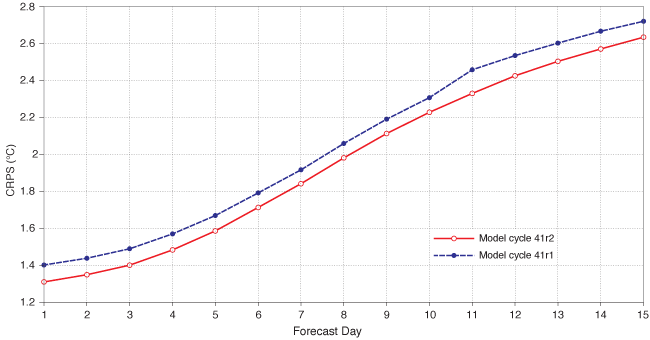 The forecasts were produced using the previous model cycle (41r1 – left) and the new model cycle (41r2 – right). The red dots in the 41r1 forecast show the location of spurious ‘grid-point storms’ where the predicted accumulated precipitation is larger than 100 mm. The grid pattern is built up starting from an octahedron enclosing the globe, giving rise to an ‘octahedral grid’. This grid works well with numerical schemes which are well adapted to future highly scalable supercomputer architectures. To maximise efficiency gains, it was decided to keep the number of waves used to represent meteorological fields constant, while increasing the number of grid points used to represent each wavelength. The resulting grid is referred to as a ‘cubic-octahedral grid’. The substantial efficiency gains achieved in model cycle 41r2 will make the task of continually improving the weather forecast more sustainable. First of all thanks for your excellent blog. As a retired NOAA Met and science nerd, I often find details on yours that I haven’t found on other sites. Your explanation of the improved ECMWF is excellent !. Thanks agaun.